"Honour thy father and thy mother". Young Anka and her father have lived together since her mother's death, and have always been more like close friends than father and daughter. One day, Anka discovers a letter from her mother whose contents make her question her whole relationship with her father... if that's indeed who he is. My favourite of series... so fa While I'm only halfway through Decalogue so far I just had to write a comment about how much I loved this particular episode, honour thy father and mother. Let's just say this episode is my favourite thus far because its characters are so beautifully drawn out, each one dealing with their own separate issues (it'd be interesting to hear differing perspectives from male and female viewers). Thanks to Kieslowski's direction which refuses to waver from the characters unlike the meandering camera of some of the other episodes, the emotional tension between the father and daughter is able to constantly build upon itself reaching a higher level than that of the other series' characters. 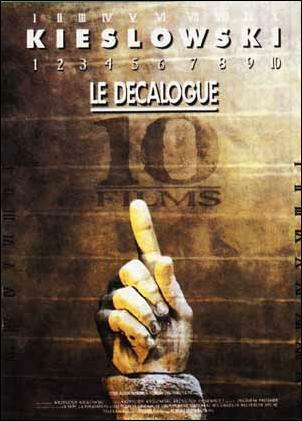 Decalogue is definitely an empathetic series in which we're constantly being asked to identify with all the varying characters (and through them examine the issues that spring out of their situations). From this perspective, "honour they father and mother" is perhaps the most effective. While other series' generally settle into a certain "intellectual state" for the majority of each episode the characters of episode four are almost always in a state of emotional flux, constantly being thrown new twists. Because the episode is so short and yet full of so many twists we're not given the ample time supplied by other episodes to think through each viewpoint which is exactly what's so brilliant about it. Each character's constant struggle to balance their physical, emotional, intellectual and social needs perfectly captures what it is to be human, which is precisely what I found to be Kieslowski's greatest and most unique gift to the art of film.